Washington, DC, December 4, 2012 – A government-wide Freedom of Information Act audit by the National Security Archive has found that sixty-two out of ninety-nine government agencies have not updated their FOIA regulations since US Attorney General Eric Holder issued his March 19, 2009 FOIA memorandum to all heads of executive departments instructing them to make discretionary FOIA releases of documents that might be technically exempt from release (especially with respect to the "deliberative" b(5) exemption), to proactively post records of interest to the public, and to remove "unnecessary bureaucratic hurdles." 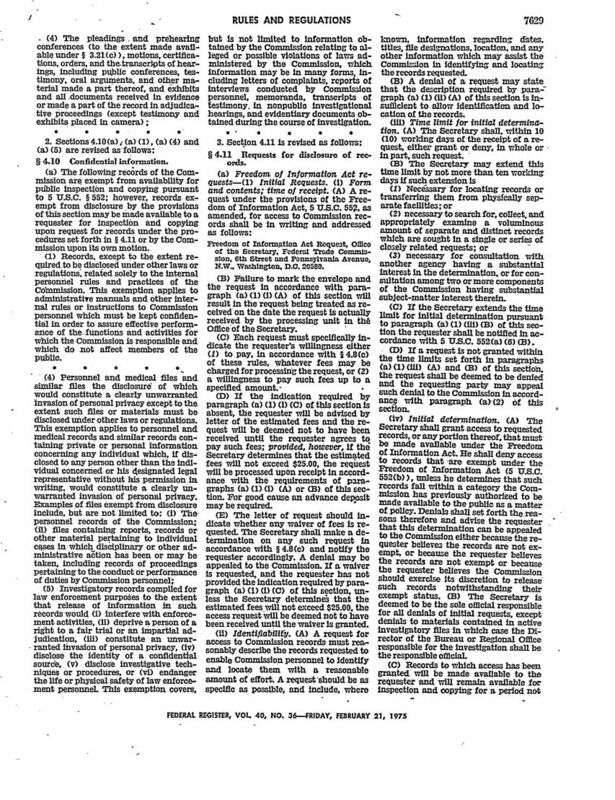 Original FTC regulations from 1975, still on the books. Fifty-six agencies have not updated their Freedom of Information Act regulations since the passage of the OPEN Government Act of 2007, which mandated that agencies reform their fee structures, institute request tracking numbers, publish specific data on their FOIA output, and cooperate with the new FOIA mediators at the Office of Government Information Services. Three previous Knight Open Government Surveys conducted by the National Security Archive found that despite President Obama's day-one clarion call to improve FOIA, results at the agency level have been extremely mixed – at best. For example, after Obama's first year in office, only 13 agencies could point to concrete changes to their FOIA practices; two years into the Obama presidency, and after a sharply-worded White House memo, only 49 agencies had taken concrete steps to improve their FOIA practices. The primary cause of this FOIA failure has been the inability of Congress and the White House to find a way to compel recalcitrant agencies to comply with FOIA. "Outdated agency regulations really mean there's an opportunity here for a second-term Obama to standardize best practices and bring all the agencies up to his day-one openness pledge," said Tom Blanton, director of the National Security Archive. At government-wide FOIA training sessions, chief FOIA officials have stated that agency FOIA regulations are the primary tools that FOIA officers should rely upon to make proper decisions while processing the public's FOIA requests. Of course, recently updated regulations do not automatically make good regulations. The Federal Reserve System – which updated its regulations in October 2012 – continues to stiff requesters by allowing just ten days to appeal FOIA denials – including postal transit time! The Department of Justice recently received the National Security Archive's "Rosemary Award" for worst open government performance by a federal agency for attempting to sneak through regulations that would allow lying to FOIA requesters, exempting online publications from being considered news media, and disqualifying most students from receiving FOIA fee waivers. Embracing direct communications with requesters to focus, narrow, and clarify requests rather than rejecting outright requests not perfectly constructed. Substantially reducing the use of discretionary withholdings, such as the b(5) "deliberative process" exemption. Congress mandated that documents under the Presidential Records Act -concerning decisions made at the highest level- cannot be withheld under the b(5) exemption after the president leaves office. At the very least, this standard should also apply to documents requested under FOIA. Preventing requests from becoming lost in "consultation" and "referral" black holes where multiple (sometimes endless) reviews and re-reviews can cause extreme delays in releases or even lost requests. These black holes can be avoided by sending requests for consultation and/or referral as rarely as possible; informing requesters of the status of their requests (even if they are being processed by a different component or agency); and continuing to track the progress and ensure the completion of FOIA requests, even after they have been passed along to other parts of the government. Proactively posting documents of likely interest to the public, such as the Department of the Interior's response to the 2010 Deep Water Horizon Gulf oil spill, as required by the 1996 e-FOIA Amendments. The Archive's audit also found that seventeen agencies did not properly post their regulations on their FOIA websites, as required by the Electronic FOIA Amendments of 1996. 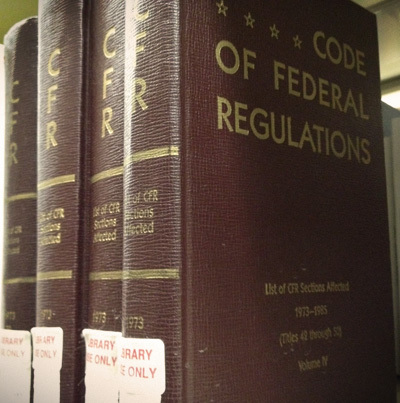 (Twelve agencies have not updated their regulations since the E-FOIA Amendments became law.) The National Security Archive sent FOIA requests to these seventeen derelict agencies requesting copies of their FOIA regulations, but after three months only seven have responded; the law requires that agencies respond within 20 business days. One agency, the US Trade and Development Agency, explained that it does not even have FOIA regulations, because, bafflingly, it " currently does not have a Code of Federal Regulations chapter." Excerpt from USTDA FOIA request appeal response letter. The oldest FOIA regulation on the books belongs to the Federal Trade Commission, which has not been updated since 1975. The FTC does have a FOIA website and online submission form. However, the website's "What's new with FOIA" section lists a 2005 George W. Bush Executive Order. According to the Archive's FOIA Coordinator, Nate Jones, "These forgotten regulations and FOIA backslides demonstrate that President Obama needs to install a Transparency Bulldog in the White House whose sole responsibility is to track, cajole, and force federal agencies into complying with the law of the Freedom of Information Act and ensure that the President's commitments to openness are not ignored by the agencies he leads." 2011Knight Open Government Survey: Eight Federal Agencies Have FOIA Requests a Decade Old . UPDATE: This post has been updated to reflect that as of October 1, 2012, six agencies, rather than three, have joined FOIAonline. Support for this FOIA Audit was generously provided by the CS Fund and the Open Society Foundations. Support for previous FOIA Audits was provided by the John S. and James L. Knight Foundation.